Before the monsoon that's currently plaguing Northeast Ohio hit, I had a chance to stop by the Tremont Tap House to enjoy dinner on their spacious patio. I didn't quite know what to expect from the tap house. It's off the beaten path in Tremont and has a pretty eclectic menu - and a heck of a lot of beer. I'm not all that concerned with a restaurant's beer list, but according to my meatatarian, beer drinking boyfriend, their selection was pretty impressive. The restaurant is in an old house (shocking for Tremont, I know), but one of the nicest features is the huge patio off the side of the house. They have enough tables to accommodate parties large and small and they even have a huge fire pit surrounded like chairs. It feels homey, in a hip way. We started our meal with the pretzel appetizer. Well, I got a small taste, but my boyfriend seemed to like it. I thought it was a little bit sweeter than your normal soft pretzel, and maybe even a little softer. I got the house salad to start. It was pretty large, and if I hadn't been famished from walking around at the Taste of Tremont, it might have been enough food for a meal. 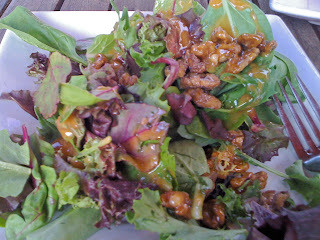 The tomato dressing was really good. The best part of my meal, hands down was the macaroni and cheese. This was no ordinary macaroni and cheese. It was made with Brie, rosemary, and figs. Who'd have thunk it? I've never cooked with figs before, but I'd love to see what I can whip up with them. 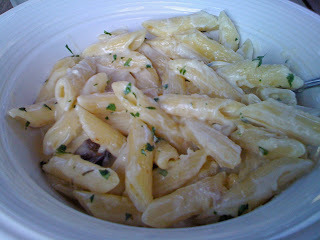 I liked this pasta dish so much that I might even try to recreate it at home. It was surprisingly light for a macaroni and cheese dish, even on a warm day. I hear that the tap house whips up a mean brunch that's served until 4 on Sundays. Too bad I'm not all that into breakfasty foods, because I'd love to see what they have to offer. If you're looking for some great food, a nice patio, a huge beer list, and want to support one of the lesser known restaurants in Tremont, be sure to check this place out. Their brunch is outstanding. I'm a big fan of the Bucknuts! Buckwheat pancakes with apple compote and candied walnuts. The apple compote is just like apple pie. I recommend you give their brunch a try. That sounds delicious! I'll have to give it a try sometime!